Haddon Heights police Officer Daniel Hunt, left, appears in a Boston courtroom in this image from WBZ News in Boston. 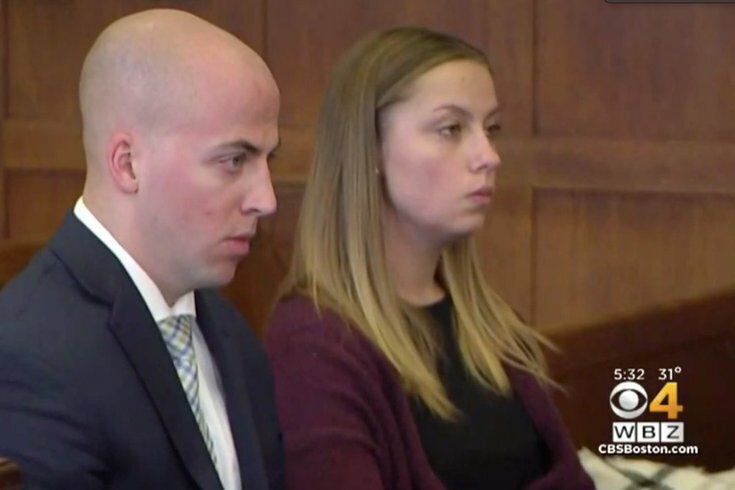 A South Jersey police officer who pleaded guilty to assault and battery of a hockey player in Boston could have the charge dismissed. Daniel Hunt, 27, of Barrington, Camden County and an officer with the Haddon Heights Police Department, pleaded guilty Tuesday for his role in the unprovoked January 19 attack on Kevin Lohan, cousin of actor Lindsay Lohan and a member of the Boston College hockey team, inside a Boston Domino's Pizza shop. If Hunt fully complies with the conditions of a two-year probationary period, the charge would be dismissed. Suffolk County Court Judge Rosalind Miller did not find Hunt guilty and instead continued the case without a finding for a probationary period of two years. She imposed orders recommended by prosecutors, including that Hunt have no contact with the victim, remain alcohol- and drug-free, and pay $2,618.67 in restitution ordered that Hunt perform 100 hours of community service. If Hunt does not abide by the orders, the case could go to trial. Lohan's jaw was wired shut for three weeks and he now has permanent metal plates implanted in his jaw and cheek. Another man allegedly involved in the attack, Ian Salerno of Philadelphia, faces a February 11 trial on charges of aggravated assault and battery, prosecutors said. In the altercation, captured on the pizza shop's security camera, an intoxicated Hunt approached the victim and initiated a verbal confrontation, prosecutors said. Hunt then pushed the victim, leading to a physical altercation. Another man in Hunt's group allegedly threw the punch that damaged Lohan's jaw, prosecutors said. Hunt was off duty at the time of the incident. On Wednesday he was still listed as a patrol officer on the Haddon Heights police web site. Just 10 days before the Boston incident, Hunt was collecting accolades for his investigative work that reunited two missing Washington, D.C. girls with their families after a routine traffic stop.